In the 18th century, the hill rising to the west of Quincy Center was pasture land commonly referred to as Stony Field. 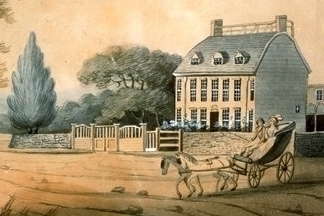 In September 1787, while he was still Minister to Great Britain, John Adams bought the property, including the estate at the foot of the hill that he would later call Peacefield. Shortly thereafter, Adams purchased adjacent land to the west from the Honorable Richard Cranch, his brother-in-law and well-known state legislator. During the 19th century, Charles Francis Adams built a Greek revival estate – “The New House” – along Presidents Lane. A second Adams property, a house built by his son, Charles Francis Adams, II was located further up what had become known as Presidents Hill. In 1894, the Adams Real Estate Trust, comprised of five heirs of Charles Francis Adams, who died in 1886, subdivided the Adams family property into three contiguous real estate trusts: Presidents Hill, Presidents Hill Annex and Cranch Hill. These would become the constituent neighborhoods of the neighborhood association. The arrival of the Old Colony Railroad in 1845 and the electric street railway in 1888 dramatically hastened suburban housing development throughout the city. The main line of the Quincy and Boston Railway Company extended from Boston through Quincy Center on route to a main juncture in Braintree. The area witnessed its most active period of development beginning in the late 1890s through the 1920s as commuters clamored for homes in the suburbs with easy access to their jobs in Boston. At the same time, the hospital that lends its name to the neighborhood opened in1888 as a twenty-five bed cottage. Dr. John A. Gordon, one of the founders, was concerned about the lung ailments that affected granite quarry workers who inhaled dust particles while stone cutting. With the support of William Ball Rice, donor of the site and building, and others, funds were raised and a state charter was granted. It was dedicated as the City Hospital of Quincy on June 17, 1890. In 1919 the hospital became a city institution called Quincy City Hospital, later to become Quincy Medical Center and currently serving as the site for the Quincy Emergency Department operated by Steward Health Care. Through its 126 year history, the hospital at 114 Whitwell Street has been a cornerstone of our neighborhoods and Quincy at large. Adapted from from the Quincy Historical and Architectural Survey (1986) and the Inventory of Presidents Hill – Hospital Hill – Cranch Hill submitted to the Massachusetts Historical Commission (1989).